India's first end to end health schedule management solution which helps in improving treatment adherence. Comprehensive Disease management Solution which can be personlized as per patient and practice. Multi-disease support. Most innovative behavior mapping algorithm to never let you miss your immunization schedule. Also helps you track growth and development of child. Fluvina Technologies Pvt Ltd has created unique product MobiHealth. It is a comprehensive solution handcrafted in consultation with doctor designed for health schedule management, disease management and clinic management. It helps in bridging the communication and information gap between healthcare provider and patients. Moboihealth is agreegation of heathcare services. Unique way to convert prescription into health schedule management and ensuring adherence of health schedule. Unique approach to help manage disease with notify, monitor, connect and inform approach. Unique way to help your patient adhere to a treatment by creating state of art treatment communication plan. True paperless cloud based clinic management system. You can do patient registration, walk-in, book appointment, Prescription, lab reports, check clinical parameters, store reports, chat, create risk profiles etc all in one place. 1st child care platform which adheres to rules defined and notification which moulds as per the behavior of parent to achieve 100% immunization dream. 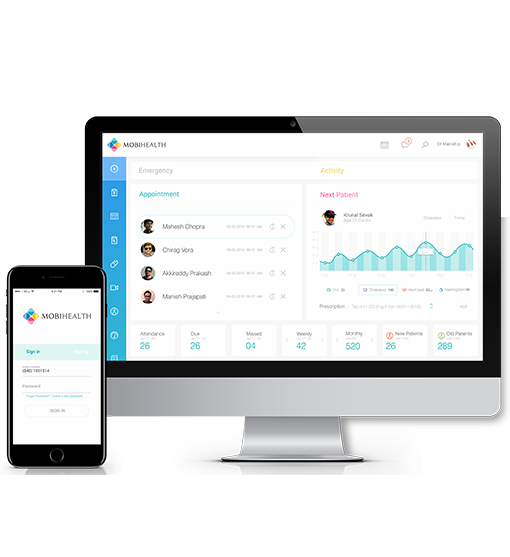 MobiHealth comes bundled with dynamic digital discharge summary which can be different for different doctor or team. It also comes up with platform for clinical research which helps you do all your clinical operation digitally. Our platform uses different visual and animated mechanism to motivate patient to maintain health life style and reduce mental stress See - Worlds first Health Emoticons to motivate patient and reduce mental stress. MobiHealth comes embedded with Heart and diabetes Risk score. It helps our user and doctor know the risk and prevent in case of border line or emergency. See - Prevention a tool to help reduce epidemic.